Earn 5199 towards your next purchase with MyRewards. The ultimate drone thermal imaging solution is here. 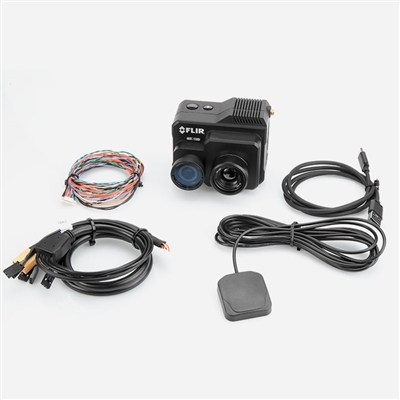 The new FLIR Duo Pro R combines a high resolution, radiometric thermal imager, 4K color camera, and a full suite of on-board sensors to bring you the most powerful dual-sensor imaging solution in the world for small commercial drones. Capture actionable data around the clock with Duo Pro R.
With two live video output options (analog video, or digital video over micro-HDMI), pilots can switch between thermal and color imagers in flight, or view them both in picture-in-picture mode, and select MSX blended imagery, all while recording video and stills on two microSD cards. Its on-board sensor suite makes Duo Pro R a self-contained airborne mapping package. Fully integrated GPS receiver, IMU, magnetometer, and barometer provide all the data needed to create accurate orthomosaics from an airborne platform without integrating to external flight controllers. Easy configuration over Bluetooth with the FLIR UAS app for iOS and Android lets pilots easily configure Duo Pro R before takeoff. Set color palettes, image optimization features, configure PWM inputs and MAVLink interface, and start recording all without lugging a computer to the field.